Stanbridge View was chosen for the ‘awayday’- the last match of the season as good catches had been had in the two matches already fished there this season. However when we got there we found that the venue had been double booked. Fortunately the other group of anglers were very amenable and they took a block of pegs at the A23 end of the lake giving us the remainder of the lake. The most favourable pegs were chosen for our match. Unfortunately heavy overnight rain dumped a lot of cold water into the lake and catches were very poor consisting of odd reasonable sized carp and bream supplemented by small carp, roach, rudd and perch. The water level was very high in the lake hiding most of the tree stumps that the venue is noted for. The carp still know where they are and several carp were lost during the match. 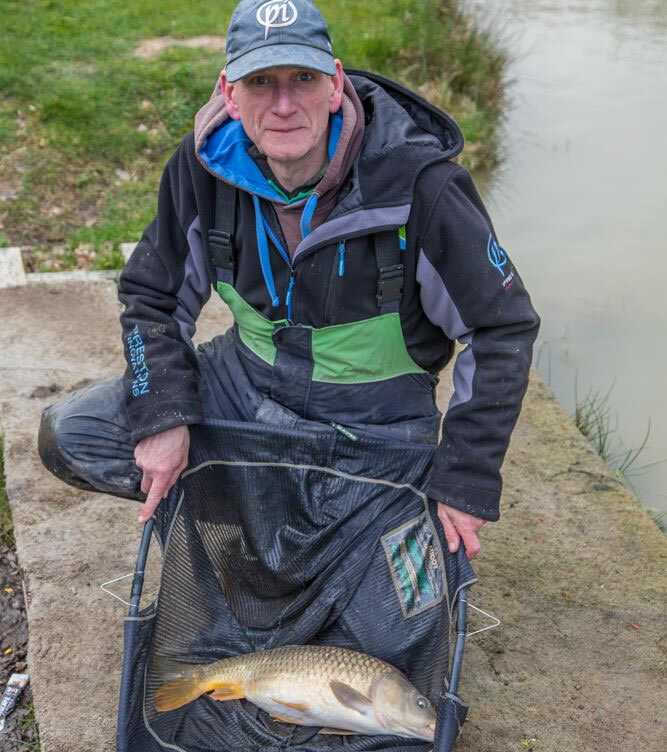 First place was taken by Steve Pentecost who caught a 8-3-0 carp first cast on the feeder and this was supplemented by small carp and roach to give him a total of 11-2-0. He also was on the Golden Peg and so had a financially successful match. 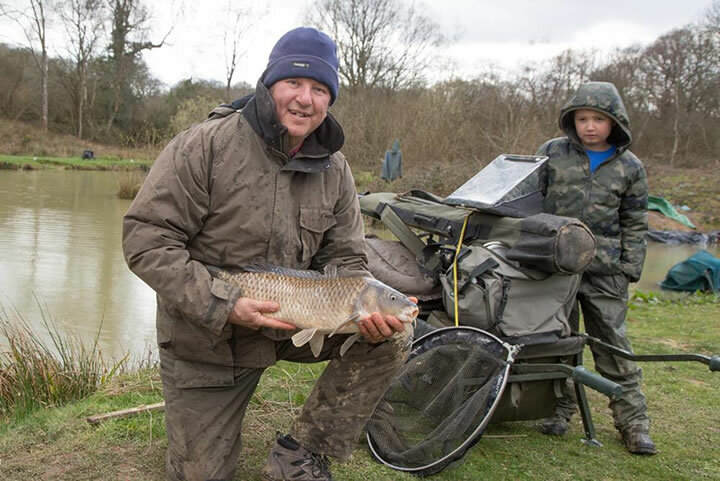 Keith Hughes was fishing on the opposite side to Steve and was struggling with only small perch and roach in his net and was being beaten by his grandson, Cody who had caught a carp and a bream. However in the last hour he managed to catch a carp on the long pole. His total catch was 7-15-8. 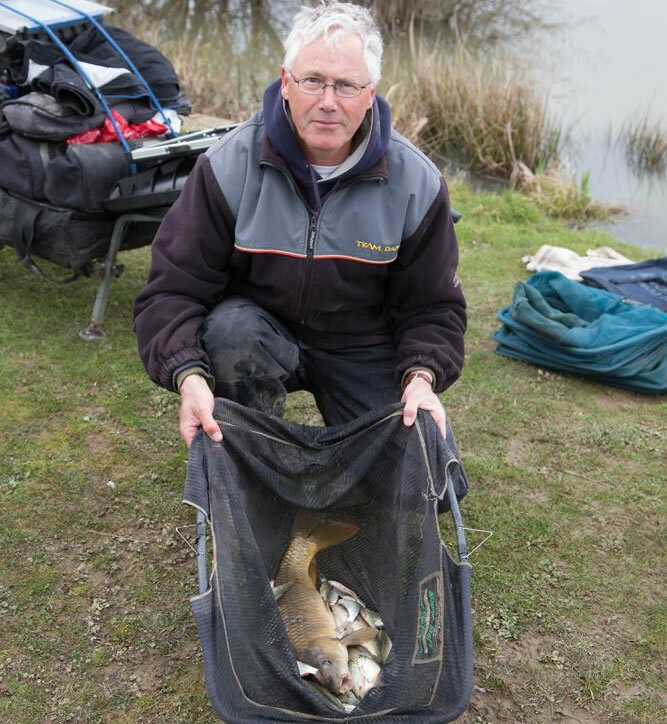 Just behind him in third place was Paul Ward who had a similar experience to Keith with only small fish until he managed to catch a carp in the margins. He fished the long pole and weighed in 7-6-0. Venue Specialist, Paul Ward, with his third place bag. At the end of the season (40 matches) Mick Greenway has won the Clubman (149 points) from Vince Herringshaw and Steve Simmonds (both 139 points), Matchman (1558) from Phil Tubb (1199) and the Aggregate Weight (350-0-0) from Paul Ward (284-12-0). This was my last match as Match Secretary and I would like to thanks all those who helped me to make my life easier over the years. Thanks to all the anglers who have fished and finally best wishes to Keith, who is taking over from me.